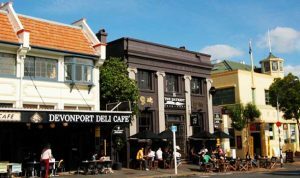 Devonport is just a 12 minute Ferry ride (they run every half hour) from downtown Auckland, we often catch the Ferry and have coffee on the ‘other side’. 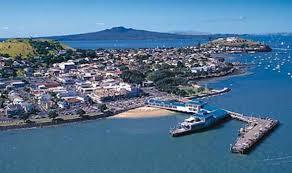 Until the Auckland Harbour Bridge was built, this was a backwater – a place for holidays and leisure pursuits. The remnants of this remain with some gorgeous old buildings in the main street and elegant older homes, now worth millions of dollars. 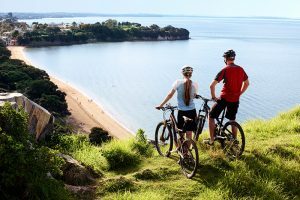 Devonport has two resident (and extinct) volcanoes which give it a distinctive skyline from the city which is duplicated in the two main ferry buildings. 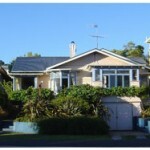 Mt Victoria is accessed from the end of the main cafe strip, North Head is a short walk away. Both are worth the walk for the views and the historic gun emplacements – not to mention the exercise. The locals sometimes take cardboard up and take a ride back down on one of the steep grassy slopes. For coffee we chose the Devonport Stone Oven Bakery & Cafe which had some spectacular baking and a great children’s play area if that is your thing. But next time, I will go further up the hill to Corelli’s – I got the feeling that the people who worked here owned it and loved it. 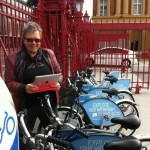 It is funky, had home made lemonade and coconut ice, and a very warm welcome. I notice it is 2/32 on Trip Advisor, and I think it deserves it. 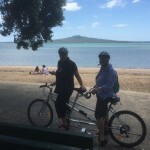 There is great walking over at Devonport, but you can also hire a bike on the wharf as you get off the ferry, or a scooter in the main street, I think that is going to be me on my next trip – take some time to explore the beaches and back streets.